December 1st begins this Thursday and it's also the beginning of Meteorological Winter. But if you've been wishing for any signs of winter the past couple weeks, we've been just out of luck. The month of November has followed the months before in keeping temperatures above average. Sure there have been some cooler days, but the majority of them have been well above average. There's already been some talk about snow for the weekend, and now for next week already (something that I will get to in a later post). But I want to talk about the system for this upcoming weekend and why we shouldn't place all our money on just one computer model. What happens this weekend is very dependent on what happens with the jet stream. Right now the jet stream is taking a major shift south in the southern states. This is what's causing all the severe weather in Louisiana and Mississippi. It's also what brought over a foot of snowfall to some towns in North Dakota! The big dip in the jet stream weakens somewhat closer to the end of the week as models begin to forecast another strong low developing in the far southern Plains. By this weekend, the jet stream begins to break apart into two branches: the northern branch and the southern branch. The northern branch of the jet stream is what pulls down the cold air from Canada and the Arctic. The southern branch of the jet stream is what supplies the moisture. When these two branches work together, it can lead to big storm systems and that's what one computer model was forecasting for next Sunday and Monday. And yes, it did suggest the possibility of snow. However, another long range forecast model meteorologists use had a much different scenario. It suggested these two branches do not work together (or phase) leaving us with a much weaker low pressure system and less precipitation. Today the model that suggested a possible big snow was now indicating a weaker phase (coming together) of the two branches of the jet stream and suggesting a weaker low, but still with precipitation that would likely end up as a wintry mix. And the model that had the weaker low to begin with is completely dry! So before we get too excited about any winter weather making an appearance in Northern Illinois and Southern Wisconsin, we have to look at the overall pattern and what it means for the evolution of possible storm systems. A phasing jet stream means a stronger low pressure system and a non-phasing jet stream means a weaker low pressure system. Another factor in trying to determine precipitation type is the track of the low. And trying to pinpoint that a week in advance is next to impossible! As we get closer to the weekend we will definitely have a better idea of what will happen, but until then don't believe anything else you see suggesting significant snowfall. I've always said a little sun can go along way! And the sunshine Tuesday helped warm afternoon highs into the upper 40's and low 50's. Unfortunately we are going to lose that sun by Wednesday morning as a strong, but slow moving, low pressure system spins over the Great Lakes. The incoming cloud cover will also come with a cooler air mass which will be one factor in helping to develop a few widely scattered showers by Wednesday afternoon and evening. But as colder air does get wrapped into Northern Illinois and Southern Wisconsin, it's possible that snow flurries or even light snow showers could also mix in. I want you to think of this low like a wagon wheel. And the spokes around a wagon wheel are similar to smaller low pressure systems that rotate around the main parent low. As each low passes, it can produce its own weather. For us, these lows will help enhance cloud cover through the week but also generate lift in the atmosphere as the surrounding air is trying to fill in the lower pressure aloft. You can already see how expansive the cloud cover is back to the west and the snow showers associated with it. Now we won't see that much snowfall, but a brief period of all snow is possible late Wednesday evening and Wednesday night. 1.03" which broke the previous record of 0.97" set in 1987. In total for the past 48 hours, Rockford's rain totaled 1.03" with Monroe seeing some of the highest two-day totals, at 2.22" of rain. 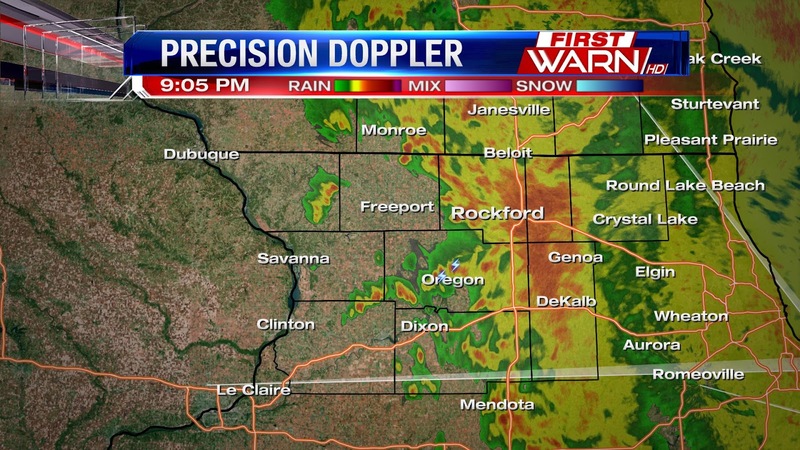 For Rockford, the November total is at 1.66" bringing the rain to a surplus of .24". We needed that soaking rain, because the months of September and October were quite dry. Since September, Rockford has totaled 7.35" but we're still 1.09" from the average. storm total rainfall amounts over an inch and a half in many spots! Another impressive aspect with this storm have been the temperatures. Temperatures have been on a slow rise since this afternoon, despite the heavy rainfall. This is primarily due to the strong warm air inflow ahead of a strengthening low near La Crosse, WI. Highs Monday were reached after dark, reaching 51 degrees at 5pm! Drier air will bring down dew points slightly by Tuesday morning. So I expect temperatures to drop into the low 40's by morning. Flip flopping weather conditions as we head through this week. We start off with mild but soggy weather today, and end the week with more of a winter chill. A strong and stacked low pressure system is currently spinning in the Dakotas brings snow for the upper Plains and colder temperatures, while the Midwest is in the warm sector of this system. Ahead of the low southerly winds will strengthen as the low strengthens too, which helps to draw in warm and muggy air from the south. Warm air advection ahead of the low will bring temperatures in the upper 40's and low 50's into Tuesday, but we pair that with periods of rainfall on Monday. The first round of rain arrived last night and was out of the Stateline before 2am with many towns picking up anywhere between 3/4 to over an inch of rainfall. While there will be a break through the morning hours we aren't done with the rain, another round of off and on rain showers arrives a little before lunch time today and that could add another 3/4 of an inch of rain to those totals. Rain will continue through midnight before dry air arrives behind our first cold front. We still will notice mild temperatures Tuesday, and it actually looks to be the nicest day we have this week. Drier air brings more sunshine, and breezy southerly winds will help temperatures make it into the low 50's. 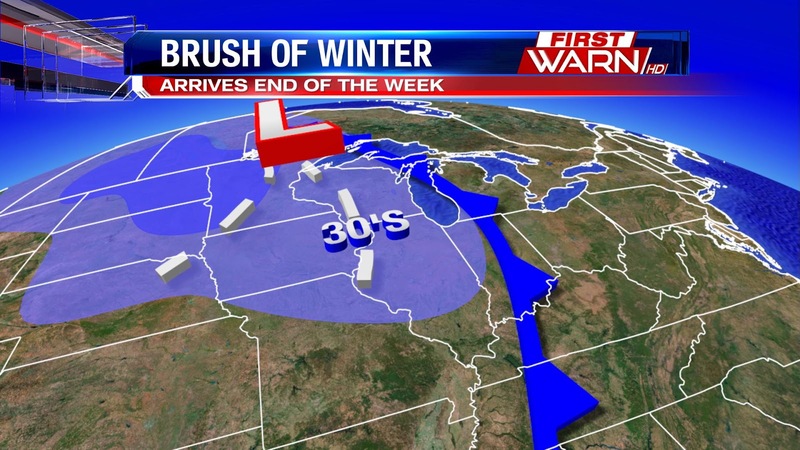 like with high temperatures through the week dropping, we'll get highs in the upper 30's by Friday. Anyone else feel like they were in a fog Sunday afternoon? If so, it could have been because it was so foggy outside most of the day. At times during the afternoon, visibility dropped under a mile prompting a Dense Fog Advisory for some. The fog also had an impact on our high temperatures leaving most of us in the 30's. Temperatures will slowly rise through the overnight as rain from Iowa increases. The image to the left is a 'snap shot' of the atmosphere Sunday morning from the Quad Cities National Weather Service. It's called a Skew-T diagram and shows the temperature, dew point, wind speed and direction from the surface up to where the jet stream is located. Every morning and evening National Weather Service offices launch weather balloons to help gather information of the atmosphere above our heads. 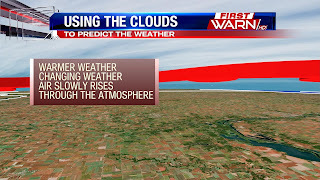 This information is then fed into our weather computer models that help meteorologists predict the weather. The red line is the air temperature and the green line is the dew point temperature. When the two lines are close to each other, the atmosphere is pretty saturated. When the lines are apart the surrounding air is dry. On the bottom of the graph (the X axis) are temperatures in degrees Celsius and on the left ( the Y axis) are heights. Notice what happens to the temperature as it goes further up into the atmosphere...it warms! This is called an inversion. Inversions occur when the temperature aloft warms faster than the surface temperature. This happens quite often in the summer and spring, and can limit thunderstorm growth. In the fall and winter an inversion can keep fog stuck at the surface. The inversion this morning trapped moisture near the surface of the earth. And since the sun angle is reaching it's lowest point as we approach the winter solstice, the air was unable to mix keeping the fog around longer. Incoming rain from the south and west will actually allow some of the fog to dissipate this evening, which will help with visibility. 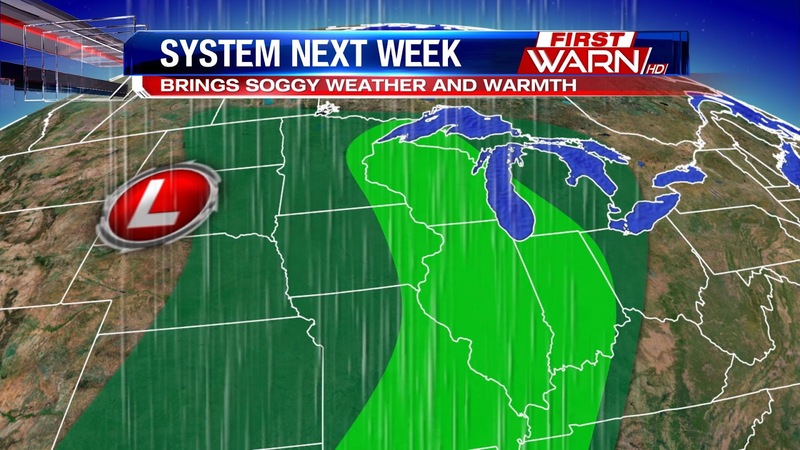 A decent soaking rain will start the work week as a strong area of low pressure moves into the Upper Midwest. Following a little fog Sunday morning winds will increase from the south pushing temperatures into the upper 40's, to near 50 degrees. Cloud cover increases as gulf moisture is pulled northward by Sunday evening. Look for showers to begin after sunset and become heavy Sunday night into very early Monday morning. The heaviest rainfall is done by Monday morning with only light showers, or even drizzle, expected during the day. By Monday evening the rain will pick back up before ending by Tuesday morning. On the colder side of this system snow will fall over the Rockies and High Plains. Rainfall totals will be close to, if not slightly over, one inch. It's some much needed rainfall as the month of November is running close to two inches below where we should be. We'll still end the month on a deficit, but at least we will get some rainfall before we begin December. Thanksgiving and Black Friday both featured plenty of cloud cover and areas of drizzle. Both afternoons were quite chilly as well, with highs near 40°. A break is in store for both Saturday and Sunday with partly sunny skies expected each day. The better news is that temperatures will push the 50-degree mark each afternoon behind the southerly winds and peaks of sunshine. But, as is typically the case, the nice weather won't last. Rain will move in Sunday evening and last through early Monday morning. That will be associated with one area of low pressure. A second area of low pressure will edge north from the Mississippi River Valley region by Monday afternoon. That low will bring an additional threat of rain with it late Monday afternoon through late Monday night. Between the two low pressure systems will exist a possible lull in activity from Monday morning through late Monday afternoon. During this period it's certainly possible that we could see some drizzle or light showers, but many will see dry time during this stretch. The good news is that temperatures should still reach the 50's Monday afternoon. Tuesday looks dry with high temperatures once again topping out near 50°. By the time we get to Tuesday morning the rain will be over. Many locations will see anywhere from one half-inch of rain to as much as more than 1" of rain. Skies look drier to round out the week, but clouds will remain strong each day as temperatures drop back to seasonal levels in the 40's. Weekend weather remains pleasant through Saturday and Sunday for most of the Midwest. High pressure ridge builds in Saturday afternoon which features a drier air mass. This will help get rid of the thick cloud deck we've had for the past couple days. Stroll on State in Rockford Saturday features very pleasant weather! Thickness levels rise in the atmosphere, which means temperatures will be rising! With the kickoff for the event at 3pm temperatures will be in the upper 40's to near 50° along with partly cloudy to partly sunny skies. Winds will be turning to the southwest for the afternoon. Temperatures then for most of the event will be in the mid to then low 40's, but should fall into the upper 30's by the end of the event at 9pm. A strong low pressure system develops in the plains Saturday and Sunday, and this will bring widespread rain by Sunday afternoon from Iowa to Missouri and into portions of the central Plains. If you're traveling on Sunday, especially in the afternoon you will run into rain and even thunderstorms, while the Stateline and the upper Great Lakes region stays dry. However, that system will bring widespread rainfall late Sunday night into Monday morning. Dry air wraps in and shuts off the rain midday Monday before another round of rain Monday night into early Tuesday. After that a strong cold front passes dropping temperatures into the low 40's through the end of next week. Thanksgiving was chilly, but we stayed dry under an overcast sky. Those low clouds will hang with us through the night and through the day on Friday. A weak disturbance will move swing to our north during that time frame as well, which could spawn a few light snow flurries or sprinkles. 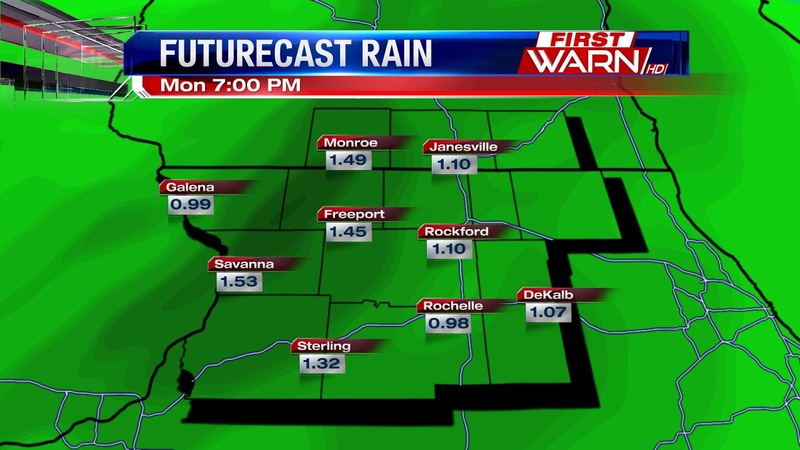 However, much of the Stateline will likely remain dry and avoid any precipitation. Thus, if you are venturing out to do some late-night shopping tonight, you may be greeted by a few snowflakes. No accumulation is expected, and the roads will remain in great shape. Temperatures tonight will be cold, but considering December begins in a week, low 30's are not all too bad. Just be sure to dress warmly as you head from store to store. If you are waiting until the sun rises on Friday to hit the stores, prepare for another overcast day with low clouds holding strong all day. Temperatures will push into the low and perhaps middle 40's, which is right where we should be this time of year. Be sure to dress warm and enjoy your holiday shopping! We received some much needed rainfall Tuesday and Wednesday, but we're still about an inch below where we need to be for the month. Minnesota and far northern Iowa, but will fizzle out by the time it reaches Northern Illinois. This is because the high pressure system that will be with us Thursday will help to block moisture from the south. Temperatures will only briefly drop near freezing Thursday night, so if it holds together long enough to provide some precipitation it would likely fall as a rain/snow mix before a transition over to light rain Friday morning. A bigger system looks to impact the Midwest early next week. This one could bring with it a decent amount of rainfall. If you are heading out in the next couple off hours you will have to contend with reduced visibility and fog this morning. Visibility has dropped to about 2-4 miles across the Stateline and into Iowa, this will persist into the afternoon and could cause some travel issues, definitely a day to take it a bit slower out on the roads. 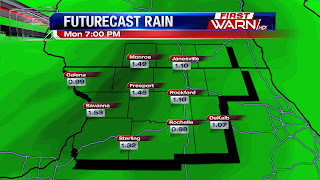 You can expect off and on light showers across the Stateline today then turning to damp and drizzly conditions late afternoon and early evening. 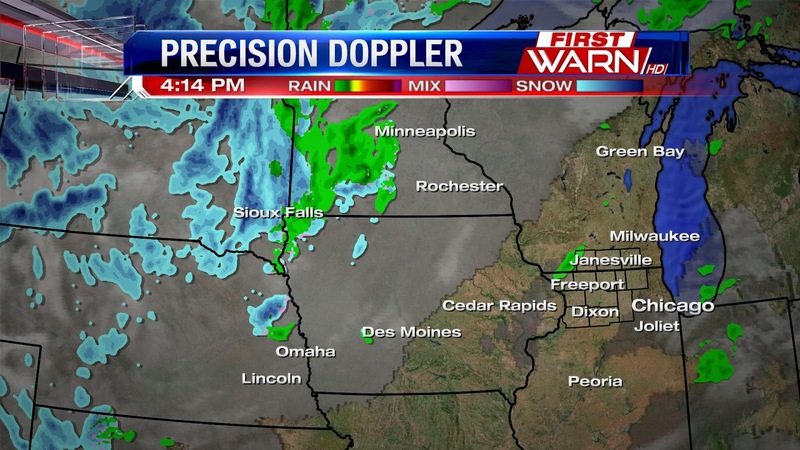 If you are heading west into Iowa you have a few showers and the fog to deal with this morning into the afternoon. 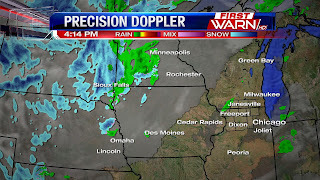 Conditions west will improve for the late afternoon and evening, as the low pressure departs Iowa and into Wisconsin, you will notice drier skies. 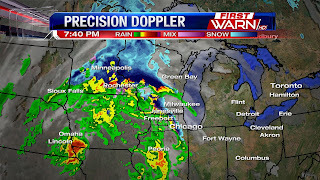 Snow is falling north of Madison through northern Wisconsin and into Minnesota, about two to four inches will accumulate into the afternoon and early evening. Overall you will want to plan a lot more time for traveling with slick roads something to watch for. If you are heading west into Indiana the rain threat will continue into the evening but will still dry out for Thanksgiving on Thursday. If you are heading south into central Illinois rain will continue into the evening as well as a passing shortwave will bring more rain for the early evening. Partly sunny skies will be the trend for Thanksgiving with highs in the low 40's. Low pressure over Kansas continues to strengthen and will move northeast towards Northern Illinois by Wednesday afternoon. been issued for the wintry weather from central and northern Wisconsin west into Minnesota. That's where the trouble spots will be through Wednesday night. Further south it's mostly rain that's been falling, but there have been a few reports of sleet along the leading edge of the rain band over Northern Illinois. I do not anticipate this to be a major issue and we should see a complete transition over to light rain through the night. Roads will be wet Wednesday but snow covered from Northern Wisconsin to Minnesota. So if that's the direction you're heading, be careful. 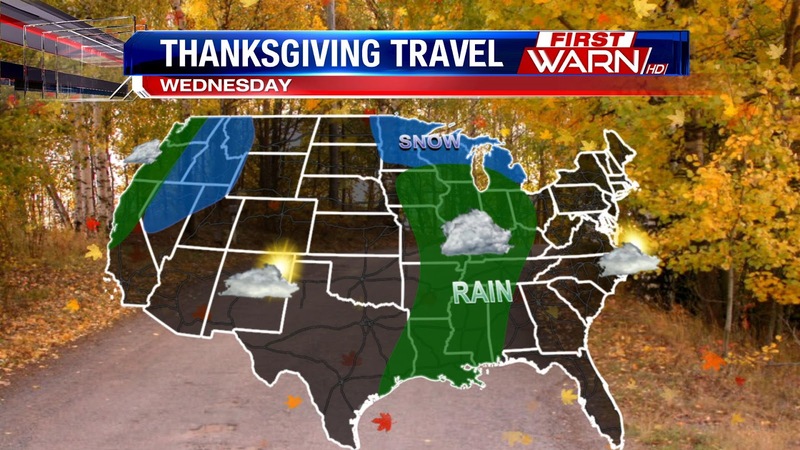 Soggy days lead up to Thanksgiving this year, and while they could cause some travel headaches (check out the post below) the holiday itself will be very nice. Behind a potent departing system Thursday, there will still be enough lingering moisture to keep some of the clouds around, some locations however could turn partly cloudy. Temperatures will be near seasonable levels in the lower 40's. 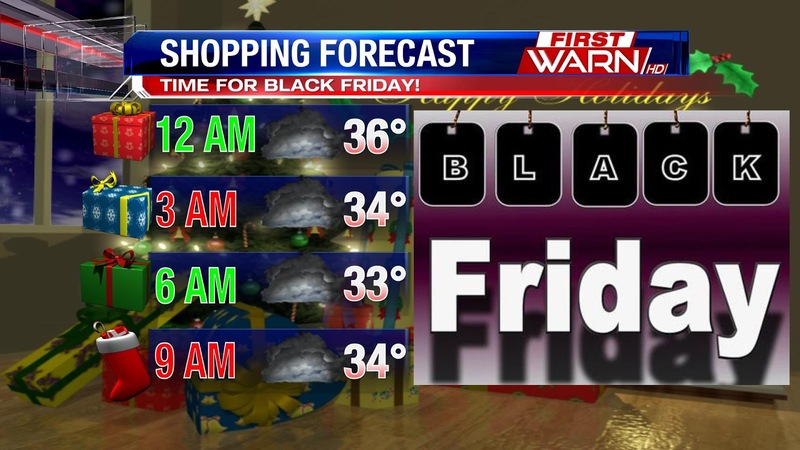 So if you plan to travel a bit on Thanksgiving there won't be any travel woes, though it you are heading out for shopping Thursday night temperatures will be falling into the upper 30's. If your shopping will keep you out and about all hours of the night, expect a chill and to take it slow on the roads. Temperatures will fall into the mid 30's but our next system will bring the chance for light snow showers and a bit of rain late Thursday into Friday morning. Plan to use caution while driving, Thursday night into Friday as that system quickly passes. The snow and rain showers will only stick around through midday Friday before that too departs to the east. Wow! I still can't believe Thanksgiving is just 4 short days away and soon we'll be ringing in the new year. Where has this year gone?!? As we get ready to pack up and hit the road, air or tracks this Thanksgiving, weather will likely have an impact on your travel. 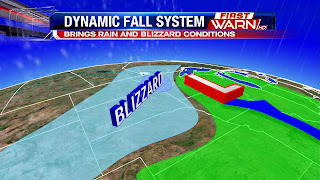 A potent storm system will sweep through the Midwest Tuesday and Wednesday bringing with it steady rainfall and snow. Rain for Northern Illinois and Southern Wisconsin has been in short supply lately. But that will change in 36 hours. Rain showers will overspread the area from west to east by supper time Tuesday. Our atmosphere will be pretty dry to start the day Tuesday, so I don't anticipate much precipitation to fall before late afternoon. If it does, it's possible there could be a little sleet before the transition over to rain by Tuesday night. Most of the accumulating rainfall will arrive overnight Tuesday with dreary skies, drizzle and fog leftover for Wednesday. Low clouds will likely cause delays at the surrounding airports Wednesday, so you'll want to check ahead with any airlines. Rainfall totals will add up with most in Northern Illinois and Southern Wisconsin receiving anywhere between a quarter of an inch up to three quarters inch of rain by Wednesday night. Accumulating snow is likely north of Madison with a wintry mix north of Janesville. 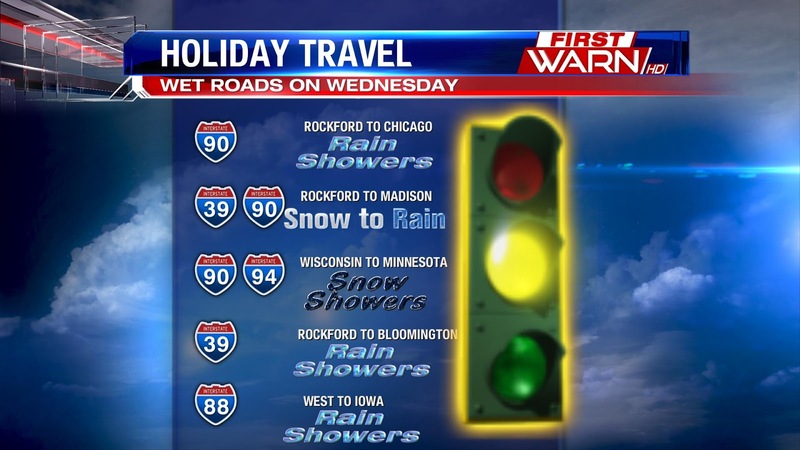 Plan ahead if you will be traveling Tuesday or Wednesday. It's official. The first snowflakes of the season have fallen in Rockford. Nothing accumulated, but it showed signs of change from the otherwise mild and dry fall. Now that we have our first flakes under our belt, what can we look for as we head towards Christmas? That's the big question that everyone wants answered: "Will we have a White Christmas?" Answering that question accurately is nearly impossible over a month ahead of time, but what we can do is take a look at what historical averages suggest. The map shown above depicts the historical probability of having a White Christmas using the last 30 years of data. A White Christmas is defined as having 1" of snowfall on the ground. As you can see, northern Illinois and southern Wisconsin fall in the 40-60% chance of seeing a White Christmas category. For example, Freeport has seen 15 of the last 30 Christmas mornings feature at least 1" of snow on the ground. That is right at 50%. Most locations across northern Illinois have recorded a White Christmas 15 of the last 30 years. And, believe it or not, in 1951 Dixon had 25" of snow on the ground on Christmas. Meanwhile, Paw Paw had an incredible 27" on the ground! That year featured the most snowpack on a Christmas ever recorded across northern Illinois. The most snow to ever fall in Rockford on Christmas occurred in 1909, when the city recorded 6". Going all the way back to 1905, Rockford has seen 65 Christmas Day's with no snow, 21 Christmas Day's with a trace of snow, and 21 Christmas's with more than a trace of snow. Overall, we have had more days without snow than with snow. Areas that are nearly always white on Christmas include Main, Upstate New York, Minnesota, and the mountains across the Western United States. So if you want to see the white stuff fly, head to one of those locations! Who remembers this time exactly one year ago? I do! A potent area of low pressure brought over a foot of snowfall to parts of Northern Illinois and Southern Wisconsin November 20th and 21st. The snow started Friday late afternoon and continued through Saturday afternoon. A convective snow band developed just north of Rockford near the Wisconsin/Illinois border with snowfall rates of 1" to 2" inches per hour falling. Officially Rockford received 8.8" of snow between the 20th and 21st. Areas north picked up anywhere between 8" and 16" and places south of Rockford received anywhere between 4" to 8". That was quite a storm. One week later on Thanksgiving we had enough warm air in place to bring over an inch of rainfall, melting most of the snow away. The weather looks a little more active during the week of Thanksgiving. 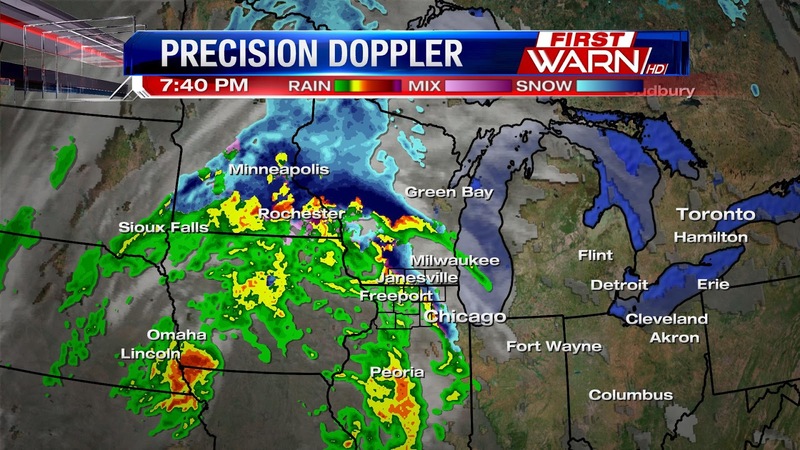 This means if you're traveling anywhere over the Midwest, you may encounter some bumpy weather. The first in a series of storm systems arrives in the Midwest Tuesday and Tuesday night. Ahead of a warm front temperatures will be gradually rising through the 30's into the low 40's by Tuesday evening. Most of the precipitation should hold off until Tuesday evening in Northern Illinois when temperatures are above freezing. This means rain should mostly fall. Further north, temperatures will be very close to freezing allowing for either a mix or all snow to fall from Wisconsin to Minnesota. If precipitation does occur a little sooner for Northern Illinois, it could briefly start off as a mix before transitioning to all rain. Warm air arriving ahead of the low will maintain light showers Tuesday night into Wednesday morning. Skies will begin to dry by Wednesday afternoon. Thanksgiving day looks dry, but another low pressure system will be quick to move in by Thursday night. This low will track a little further south than the previous low which will allow cooler air to be pulled southward. By Thursday night, a mix of rain and snow could occur over Northern Illinois and Southern Wisconsin lasting into Friday morning. 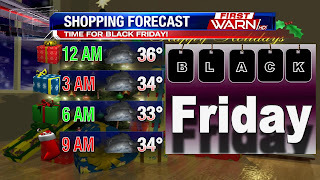 If this forecast holds, it could cause some issues for Black Friday shoppers. High pressure moves back in Saturday before a weak cool front arrives Sunday. Again temperatures will be bordering the freezing mark which may lead to a very light rain/snow mix during the morning and afternoon. We've enjoyed some pretty nice and quiet weather for the first half of November. High temperatures up until Saturday have been five, to at times, twenty degrees above average. So the cold this past weekend came as quite a shock - even though this is more typical for November weather. Factor in those strong northerly winds and it felt just down right cold. The winds have calmed down, but the chill will stick around. Overnight lows Sunday night will drop into the middle and upper teens under clear skies and light winds. We should start off with plenty of sunshine Monday, but cloud cover will slowly trickle in from the west. This will be ahead of our next storm system that will bring rain showers to Northern Illinois, but possibly a wintry mix further north in Wisconsin Tuesday and Tuesday night. The changing seasons are going to try and battle it out this week as the jet stream pattern becomes a little more active. While we won't see any significant cold snaps, there may be just enough of a dip in temperatures from time to time that would allow for moisture from the south to interact with the cold air to north to cause a mix of precipitation to occur over Northern Illinois and Southern Wisconsin with each passing low this week. The first arrives Tuesday night into Wednesday. We'll be very close to the freezing line ahead of a warm front Tuesday afternoon. It looks like most of the precipitation should hold off until Tuesday evening as more moisture surges north ahead of the approaching low. However, if precipitation does develop earlier Tuesday it's possible that it could start off as a very light mix before transitioning over to rain by Wednesday morning. Another fast moving low develops to the southwest and tracks a little south of Rockford Thursday night (Thanksgiving night) into Friday morning. With a slightly more southward track, there is a better chance for a wintry mix heading into Friday morning with temperatures hovering right around freezing. Another low develops late in the weekend and this, too, could bring a mix of rain and snow for the Stateline. Well, if you've been outside over the last 24 hours, you are well aware that it is quite cold. Saturday was the coldest day since late March, with high temperatures only reaching the upper 30's. That was a far cry from the lower 70's we were treated to on Thursday. The cold was made worse by the breezy winds we saw through the day. Those winds led to wind chills hanging out in the 20's all day long. By late tonight and early Sunday morning, that will seem mild. That's because temperatures are expected to drop to 20° tonight. Add northwesterly winds at 10-20 MPH, and you've got a perfect recipe for frigid wind chills. The coldest spots will likely see wind chills dip below 10° at times tonight. That will be the coldest air we've seen since early March! Not only that, but this is the first true blast of Old Man Winter we've had this season. In fact, Saturday marks only the first day of November where temperatures stayed below average. In addition, through 18 days, November's high temperatures are more than 15° above where they should be. And while it is very chilly this weekend, temperatures do look to moderate at least slightly into next week with highs returning to seasonal levels in the 40's and perhaps low 50's. Hopefully you were able to get out and enjoy the warmth this week because a shot of winter is here for the next 72 hours. We hit 73° on Thursday, which tied the record high for the day. That was the top of the roller coaster hill. Now, we are riding downhill! Friday afternoon we rose to 68° ahead of a potent cold front. As of Friday evening, we are sitting in the upper 30's across northern Illinois. That is roughly a 30-degree drop in temperatures in just about 7 hours of time. We can thank the cold front and very strong westerly winds for ushering in that sharp temperature change. Temperatures will continue to drop into the weekend with highs each afternoon in the upper 30's and lows both Saturday and Sunday night near 20°. It would be very possible to see low temperatures drop into the teens in outlying areas each night, especially in typically cold locations such as Freeport and Rochelle. This is the first truly potent autumn storm system to affect the Midwest and Great Lakes regions. These types of systems are not abnormal. During the fall season, the warmth of the summer attempts to hang on. Meanwhile, the cold of winter tries moving in from Canada. As a result of the battling seasons, very intense low pressure systems develop and swing through the Midwest. And, typically, these systems take above average temperatures and send them back to reality, if not colder than where they should be. Did you know you can get a rough idea of what the weather will be like in the next couple of hours and days to come just by looking at the clouds? It's true! Different cloud types can tell us a great deal about incoming weather. I thought about this as I was driving into work Thursday afternoon and was looking up at the sky and noticed an increase in cirrus clouds. Cirrus clouds are the wispy looking clouds that appear very high in the sky - roughly at or above 20,000ft. Because they form so high in the atmosphere they are made up of ice crystals (because the air up there is well below freezing). But did you know that cirrus clouds usually indicate warmer weather and a weather pattern change? A good rule of thumb is that cirrus clouds indicate an impending storm system. And since storm systems, low pressure systems, have air that flows around the center of the low in a counter-clockwise fashion we warm up ahead of the low and cool down once it passes. Ahead of a warm front, especially in the fall, winter and spring seasons, cirrus clouds will appear as the warm air is gradually and slowly lifted up, condenses and freezes. As the warm front gets closer the cirrus clouds will begin to thicken up and become cirrostratus clouds, the milky white looking cloud. It's usually with this type of cloud a halo either around the sun or moon will appear. The sky will continue to thicken and darken with clouds as they lower throughout the atmosphere and it will eventually begin to rain. A good indicator that rain is roughly 12 to 24 hours away are cirrus clouds. Ahead of a cold front, air is forced upwards faster than ahead of a warm front. This quick rising of the air allow cumulonimbus (thunderstorm clouds) to develop. Following the passage of the low, stratus clouds (low level clouds) are typically found. These, too, can produce rain and give us the dreary and gray looking afternoons. So the next time you look up to the sky and see those thin, wispy cirrus clouds you know that changes to the weather will soon follow! Brrr! Just thinking about the weekend has me shivering in the weather center. And looking at all the snow showing up on radar over the Northern Plains Thursday evening reminds me of what is coming this winter season. But stepping outside Thursday afternoon you would have never guessed that there was a powerful fall storm system about to bring an abrupt end to our warmth. We tied our record high temperature Thursday, reaching 73 degrees. The last time it was this warm on the 17th of November was back in 1941! Temperatures Thursday night will still remain nearly ten degrees above our normal daytime temperature, with lows in the middle 50's. 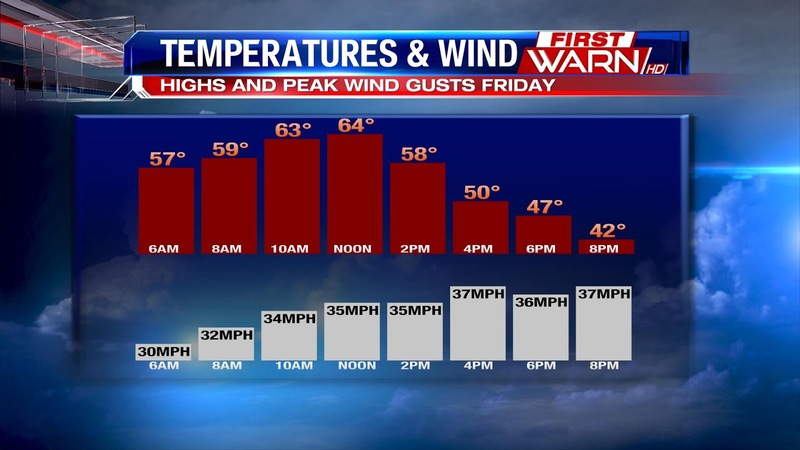 Friday morning will be very mild, but windy. 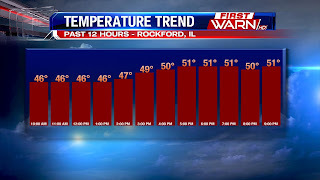 Highs for Friday will be achieved late morning to the west of Rockford and early afternoon to the east. A very strong cold front will arrive between 11am and 2pm. This will bring with it a few scattered showers, an isolated thunderstorm or two, before quickly shifting east towards Chicago by the afternoon. At first temperatures will be slow to drop, but once the cold air begins to move in it's all downhill from there. Winds will also increase right ahead of the front and behind the front with gusts between 35 and 40 mph. This will bring the air temperature into the low 30's by Saturday morning, but wind chills down into the teens. By Sunday morning, wind chills will be in the low teens! While there are a few flurries and light snow showers possible Saturday morning, the bigger focus should be on the wind and cold. This is the first true taste of cold air this season. And because we've become used to the warmth this fall, it's going to be a big shock to everyone Saturday afternoon. Winds will gradually diminish by Saturday night with incoming high pressure. Temperatures look to moderate for the beginning of next week. But we're still keeping an eye on a potential storm system during the Tuesday/Wednesday time frame that could bring some rain to Northern Illinois and Southern Wisconsin right before Thanksgiving. I'm sure you've heard already how warm it is going to be! Highs in the low 70's possible today with gusty southerly winds place. Will it be enough to break a record? We will be close! The record high temperature today is 73° set all the way back in 1941, and today the forecast sits just 2° shy of the record. We could tie the record for the day, the only question will be how much cloud cover we see through the afternoon. Either way we slice it, its going to be a warm one! However temperatures will crash into the 30's this weekend! As we get closer to the biggest travel day of the year, Mother Nature may cause some bumps in the road for holiday travelers. The week of Thanksgiving will feel more seasonable with highs in the low to mid 40's. As the jet stream pattern turns more west to east, models are suggesting a potential low pressure system developing within the southern branch of the jet stream over the Southwest U.S and riding close to Northern Illinois by Tuesday night and Wednesday morning. While the track of this low will likely support rain, it could cause some travel issues for those who are wanting to get a jump start on the holiday. This looks to be a quick moving storm with models suggesting it shifting to the east by Wednesday night. Of course this time of year the track of these types of low pressure systems are important to watch. A shift to the south could allow a little more cold air to filter in causing more of a wintry mix, especially at night when temperatures are most likely to fall below freezing. Right now it looks like Thanksgiving Day will be dry with temperatures in the middle to upper 40's. We knew it had to happen at some point. Our nice warm November would eventually turn cooler and more typical for this time of year. But before that happens, Thursday's high of 70 degrees would put just 3 degrees away from our record high of 73 degrees set back in 1941! Temperatures will remain mild Thursday night with overnight lows staying in the middle 50's. This will help warm us into the low 60's early Friday ahead of a powerful cold front expected to move through Friday afternoon. 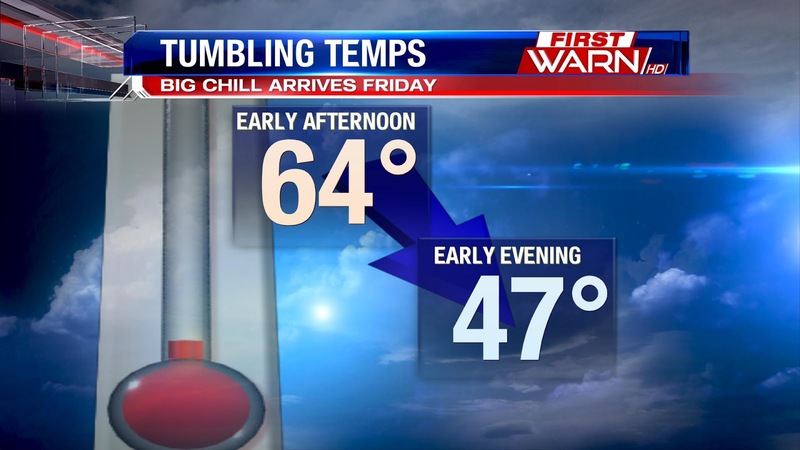 Highs Friday will warm between 62 and 64 degrees, but then drop nearly twenty degrees once the cold front passes by Friday evening. As the low pressure system strengthens Thursday night, winds will increase and likely become a bigger issue for us Friday and Saturday. Winds Friday will gust as high as 35 mph and near 40 mph Saturday. This will push wind chill values Saturday down into the 20's. Highs through the weekend will likely stay in the upper 30's with overnight dropping into the low 20's. More seasonable weather is expected the first week of Thanksgiving, but we're starting to pay close attention to a possible storm system that could impact Tuesday night into Wednesday holiday travel. More on that in a later post. After a couple weeks of mild fall weather for most of the country, things will change with a potent system that arrives Thursday into Friday. A low pressure system will move out of the Rockies tonight, ahead of a deepening upper level trough in the jet stream. Because of the strengthening low pressure, cold air will be forced south and snow will spread across the Rockies with heavy snow possible. By Thursday the system will then move into the Plains again bringing widespread heavy snow possible, coating the upper Plains late Thursday and upper Midwest region Friday. Between half to a foot of snow is possible in a few locations, and because the system is strengthening winds will be very strong. With high wind gusts, blizzard conditions are possible in eastern South Dakota and western Minnesota going into Friday. In the warm sector of the system which includes the Stateline area, we will draw in strong southerly winds on Thursday that will bring highs for the day to 70° which is a good 20° above average. Other locations will have high temperatures 20-30° above average. It will be a very windy day for the area on Thursday with southerly winds at 10-20mph and gusting as high as 30mph. Ahead of the cold front, scattered showers and even a few rumbles of thunder will be possible for us Friday afternoon. Quite a dynamic system! The strongest low pressure system to affect the Midwest this fall will move through the area Friday and Saturday. It will begin to mature by Thursday morning. 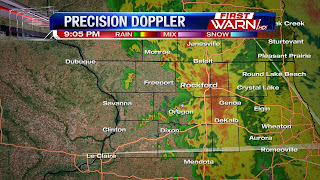 And, as that happens, a warm front will surge north of the Stateline. That will allow strong and warm southerly winds to usher into the region Thursday. Those winds should support high temperatures topping out in the middle and upper 60's Thursday afternoon. However, it would not surprising to see highs of 70° scattered across northern Illinois. It will all depend on how much sunshine prevails through the day. If sunshine sticks around all day, low 70's are certainly not impossible. 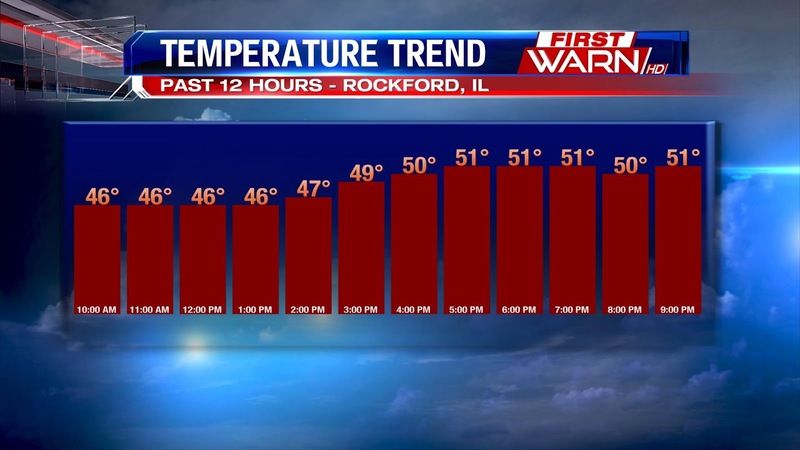 For Rockford, the current forecast is calling for a high temperatures of 70° Thursday afternoon. If we see that, we will only end up 3° shy of a record high temperature for the day! Be sure to enjoy that warmth because it may very well be the last time we flirt with 70° until 2017! In addition, a big-time drop in temperatures is expected behind the frontal boundary for the weekend. That is why we encourage you to get out and do outdoor activities this week! That front will send temperatures from near 70° on Thursday to only 40° on Saturday. Beyond Saturday, we may struggle to get out of the 30's on both Sunday and Monday! In other words, get ready for the coldest air of the season thus far. And it's not just here in Illinois and Wisconsin. Locations from Kansas City to Bismarck to the entire of state of Michigan will see their coldest air of the fall. Not only that, but several inches of snow and blizzard-like conditions are expected across the Northern Plains and Upper Midwest! The season's are definitely changing. Snow Flurries in the Forecast?! Incredible Supermoon to Occur Later This Month! Daylight Savings Time Ending This Weekend!